The circuit has already seduced many professional drivers thanks to the quality of the track and the unique environment surrounding it. 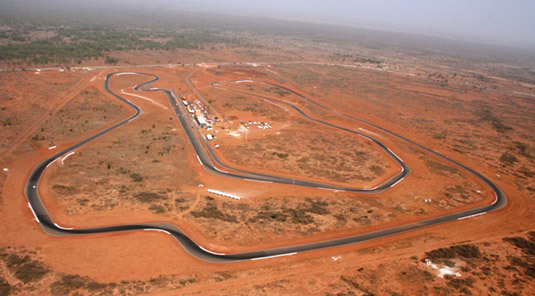 The circuit is at the heart of the savannah, surrounded by baobabs and homologated to meet FIA norms. Infrastructures such as a control tower, pits, sanitary installations, a car parking and a cafeteria have been built in the traditional Malian architectural style. An off-road track will also be created. Weather : summer temperatures with absolute dry weather between November and May (during fall / winter in the northern hemisphere). Attractive and exotic destination : wonderful landscapes and charming Senegalese people. Saly, a seaside resort, is only 20 minutes away from the circuit and boasts of a large and diversified hotel infrastructure. Proximity : many direct flights from the European capital cities (about 5 hours) and only a 1 or 2-hour time difference. Unique atmosphere : a genuine destination where the unique and outstanding African culture will definitely contribute to the success of your event. Easy and quick transport of the vehicles: many shipping companies operate in the Dakar harbour. The circuit is located on a site under customs control, hence the absence of excessive paperwork to export the vehicles (ATA carnet). The circuit of Dakar – Baobabs is located in a unique and exotic setting! Private trials are organized for motorsports lovers from Senegal and abroad. Such events also promote motorsports in West Africa, in collaboration with FSAM (Senegalese Federation of Motor Sports). The calendar of the driving days will be available soon. The circuit is on a site under customs control. Visitors will thus avoid administrative costs linked to the ATA Carnet and export formalities. Regarding the shipping of vehicles in containers, one should foresee 7 to 10 days for each trip between Europe and Senegal (either way).